We love taking family game time outdoors in the spring and summer. Games of P.I.G in the driveaway, croquet in the yard, and water balloons fights to cool off on hot days. There’s a new game in town that offers a refreshing cool down. Watermelon Smash from Yulu Toys! 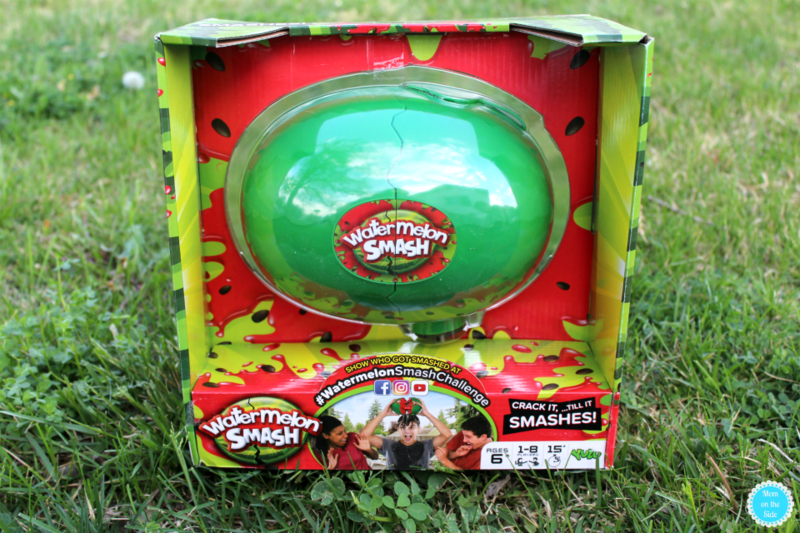 The #WatermelonSmashChallenge will be taking over the yard this summer and kids are going to love it! It’s fun, it’s easy, and it’s wet! To play Watermelon Smash, you take turns pressing a plastic refillable watermelon against your head to see who gets splashed! The included spinner tells you how many times to press the watermelon against your head as your anticipation of getting wet grows. In case you don’t want to get wet, or you’d rather play indoors on a rainy day, there are 30 plastic watermelon seeds you can use instead of water. Take a chance on the Watermelon Smash game but don’t be the one to get splashed. This all new hilarious twist on the water roulette game challenges each player to press the watermelon against your head as many times as said on the spinner. A suspenseful game in which you never know when the watermelon will fully crack open.